SAINT LAURENT-SUR-SÈVRE, France - The Montfortian International Formation or, in French, Formation Internationale Montfortaine (FIM), a French-language formation program, is being held at Saint Laurent-sur-Sèvre. It takes place from June 30 to August 6, 2017 and has three important goals: (1) to prepare resource persons, (2) to share Montfortian spirituality and (3) to experience a spirit of family and communion. This program is initiated by the "FIM Team" coordinated by Brother Maurice HERAULT FSG with the following members: Sister Immaculate FdlS, Fr. John Marie SMM, Fr. Arnold SUHARDI SMM and Brother Christian BIZON FSG. This team is supported by the General Councils of the three Montfortian Congregations represented by Brother Jean-Paul MBENGUE FSG, Sr. Jacqueline PORTEFAIX FdlS and Fr. Jorge Enrique GONZÁLEZ VÁSQUEZ SMM (former Councilor). - On the side of the Montfort Missionaries: Fr. Rebert BELDORIN (Haiti), Fr. José Angel JULCAHUANCA (Peru), Fr. Hervé RAFALISOLOHERINIRINA (Madagascar), Fr. 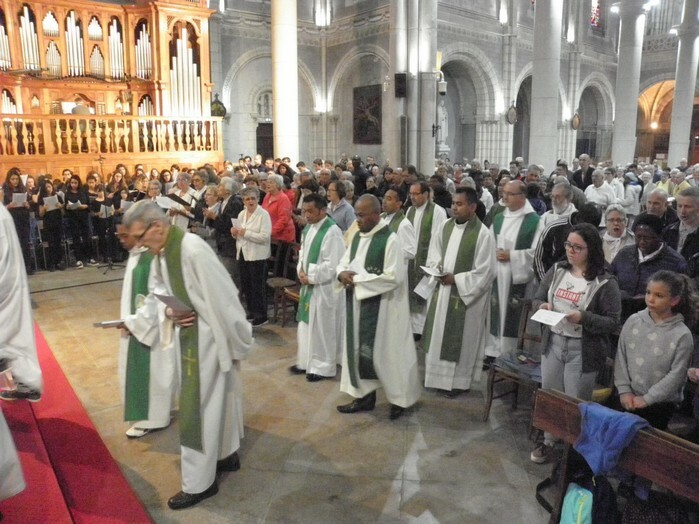 Jean-Joël RANDRIANARIVOMANANA (Madagascar), Fr. Alvaro PULIDO (Colombia), Fr. Stefan MUSANAI (Indonesia), and Mrs Pierrette MAIGNE (France). We are expecting the arrival of Fr. Frédéric BOLUMBO of Congo Kinshasa who will also participate in this program. - On the side of the Daughters of Wisdom: Sr. Maria DELLA NATIVITÀ (Italy), Sr. Suzanne LÉGER (Canada), Sr. Marie Monique JEANNOT (Haiti), Sr. Adeline RAZANADRASOA (Magadascar), Sr. Lucienne Marie ZANANOROMANANTSOA (Madagascar), Sr. Virginie BITSHANDA BOFONGA (Congo Kinshasa), and Mrs Leyla RABBAT (Canada). - On the side of the Montfort Brothers of St. Gabriel: Bro. Maixent Rock KOUBA (Congo Brazzaville), Bro. Rufin NDAMBU (Congo Kinshasa), Bro. Paul-Michel NDOUR (Senegal), Bro. Mamy Laurent RAHERISOANA (Madagascar), Mr. Jocelyn Apollinaire (Madagascar) and Mr. Daniel CEBRIÁN PÉREZ (Spain). The speakers during the sessions are: Fr. Jos VAN DEN BERGH SMM for the "Knowledge of Self", Sister Marie-Reine GAUTHIER FdlS for the "Knowledge of Jesus-Wisdom", Fr. Olivier MAIRE SMM for the "Knowledge of Mary", and finally Fr. Georges MADORE SMM for the retreat. Part of the program is also to visit and discover five Montfortian places: Saint Laurent-sur-Sèvre, Montfort-sur-Meu, Poitiers, La Rochelle and Pontchâteau. At the Mass of the first day, on July 1, 2017, Fr. Arnold, in his homily, summed up the important purpose of this program. "From this day on, we must use the word ‘WE’: we, together, as Montfortian family. Let us open our hearts to the discovery of the other, it is ourselves that we will discover! Let us get rid of the pettiness that conditions us to think that our collaboration goes only towards certain members of my congregation, without going to other congregations, or even worse without the participation of the laity. Let us destroy the narrowness of perspective which does not take into account the decisive contribution of the admirable lay people who help us to spread the spirituality of Father de Montfort. Let us not forget that Pope John Paul II received the Treatise of the True Devotion to the Blessed Virgin Mary from the hands of a layman. In his turn, the Pope has left us the following message: You have a TREASURE to share! If we do not do this, would this session of formation make sense?"